Sometimes things just roll the right way and you get lucky in life. That happened to me just last week as I was chosen to be one of the four official judges (there was also the “People’s Choice Awards”) to cast my vote on the “Best Frosting,” “Best Cake,” “Best Decoration,” and “Best Overall Combo” at the Inaugural ArtsQuest™ Cupcake Bowl. I do have a background in judging food competitions and competing in cake decorating contests, and I have a degree from the Culinary Institute of America which kind of gives me the chops to judge this event, but I have never done cupcakes before. I’m also a super huge fan of Cupcake Wars, well anything on the Food Network or Cooking Channel for that matter. So, the morning of December 29, I prepped my stomach with a banana and water and headed to ArtsQuest Center at SteelStacks along with 425 others, to this sold-out event. There were 15 Lehigh Valley bakeries that participated with some entering three selections. All-in-all there were 39 cupcakes to try! Ahhhh ... bliss AND sugar high AND then crash AND burn. I would highly recommend most of the cupcakes on this list! There were a few surprises such as the one topped with fried chicken (Cesy’s) and the after-kick from the chilis in the cake from Rodale. 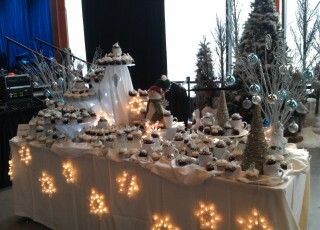 Some of the cupcakes were too sweet, some too dry, but overall what&apos;s not to love about dessert? A few of my favorites that didn&apos;t win were the Tiramisu from Antonella’s and the Coconut Cream from Louie’s. This event was a benefit for ArtsQuest’s arts education programming fund and helped raise more than $10,000 for the nonprofit’s arts education and outreach programs in the community. Do you think you would have had the chops to judge all 39 cupcakes? I know I can&apos;t wait for their Souper Bowl at the end of the month! Get your tickets now before they sell out.